Each PC also includes a backstory, roleplaying tips, special equipment, and links to the published campaign, including a campaign trait selection from AP player’s guide. Each also lists specific level advancement information for their first few levels, with further suggestions for developing the character’s long-term mechanical build. We haven’t even mentioned the fantastic character portraits courtesy of Tanyaporn Sangsnit, Lance Red, and Colby Stevenson, or the included foldable paper miniatures for every character! Plenty of our products are geared for the hardworking GM, but this one is for every gamer out there. If you are a player, these PCs should provide endless opportunities for adventure. If you are a GM, you can use these pregenerated characters as NPCs, cohorts, allies, or rivals. Even if you mostly play or run organized play “society” adventures, with a few tweaks these PCs will work for you, too. This collection of pregens intended for the "Wrath of the Righteous"-AP clocks in at 31 pages, 1 page front cover, 1 page editorial, 1 page introduction to the matter at hand, 1 page advertisement, 1 page SRD and 1 page back cover, leaving us with 25 pages of content, so let's take a look! The characters herein are made via 20-point-buy and feature advice for scaling them down for 15-point buy, if you prefer a more challenging game. Additionally, each character comes with advancement suggestions and roleplaying advice to get into the respective character from the get-go. Now presentation-wise, something becomes immediately available - even beyond previous pregen-supplements by Legendary Games, the characters herein are presented in a gorgeous way - on one page, the full-character artwork of the respective pregen, including a cool in-character quote, are provided. On the page following that, we get massive background information, physical description and the respective personality, meaning you'll usually have 3 pages per character - the artworks being btw. mostly in the league of Paizo themselves - yes, that beautiful. All right, got that? Now, the previews I saw did make the book looked slightly like everyone would be a full-armored knight, the diversity of this book actually goes farther - tale Briathos Tassiel, first character and a purifier oracle of celestial blood may be groomed to be a hero by the Inheritor's servants, but the incorruptible aasimar also makes for an interesting character in both his young age (at only 74 years) and his desire to reconnect with his celestial heritage. Caric Solnebren, the oathbound human paladin is a dual-talented man from a rich background - and his brother, the Aroden worshiping Loric Solnebren, a disillusioned sanctified rogue, makes for a great sibling rivalry fanned further by the opposition between his doctrines of Aroden and the Inheritor's code. And indeed, synergies like this are not a rarity - in the roleplaying tips and background information, a vast array of ideas is provided to make the dynamics of the group work from the get-go and provide further story hooks down the road - take Tessara Arthinest, the elven synthesist summoner with her fused celestial spirit of valor. Beyond being shielded from traumatic experiences by her eidolon (one can never be sure to whom one is talking to when addressing her!) without her knowledge (which makes for good roleplaying regarding the nature of free will), her eidolon also originates from the same celestial source that fathered Briathos Tassiel. It's small secrets like that and their suggestions that make these characters be more than pregens - they can be considered a party from the very get-go! Emerina Vestelle, the tiefling infiltrator inquisitor of Desna makes for an unconventional hero - born among evil cults, she was rescued and properly raised and now is a sensual and flirtatious lady, an uncommon contender to bringing an end to the worldwound's evil. Illemandir Ziruul, the menhir savant druid is a half-elf whose very birth was the result of the horrors bringing together two people that otherwise wouldn't have met, making him a living proof that even the bleakest of happenstances can result in positive outcomes. His connection with the land, explained as owing his life to the mastery of ley lines also makes for a superb motivation to stem the tide of corruptions. Jilani Safiro, the wild-blooded empyreal sorceror is a long way from her desert-land home - and due to her ethnicity, some racial tensions, whether justified or imagined, may be seen as a further means of providing ample roleplaiyng opportunity and ground her and the party in the lore of Golarion. Now if you're more in the mood for a battle-cleric, what about Norgrym Hammerfell, the dwarven cleric of Torag? Once abducted by evil cultists, the ordeal has made him very conscious of security and safety as well as proper strategy - that and the strange ritual they subjected him to make once again for roleplaying opportunities aplenty! Editing and formatting are excellent, I didn't notice any glitches. Layout is drop-dead-gorgeous and in 2-column full-color - the book ranks among the most beautiful I've seen, even among Legendary Games oeuvre. Weirdly, the pdf comes sans bookmarks, which makes navigation less comfortable than it ought to be. The artworks by Lance Red, Tanyaporn Sangsnit and Colby Stevenson deserve accolades - these characters jump to life straight from the page. Neil Spicer knows how to write compelling CHARACTERS. Not just some pregens, CHARACTERS - people that are compelling enough to use as NPCs even if you're not looking for pregens, characters that do not follow each stereotype. Indeed, the pregens herein, in whatever constellation used, brim with roleplaying potential, feature so many cool angles, so many story-seeds, that even if used in a context that is not the Wrath of the Righteous AP, that any DM worth his/her salt can craft a whole campaign around them alone. Yes. That awesome. Their connections make them a party from the get-go, with all dynamics that entails and in the end, the characters also are superb reading. It should also be noted that the advice on character advancement also provides mythic path-selection advice. Apart from the missing bookmarks, I have exactly zilch to complain about here - these are, even by Legendary Games high standards, probably the best Pregens released so far and deserve no less than 5 stars + seal of approval. 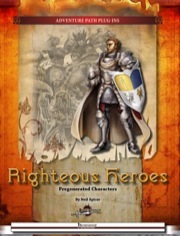 Righteous Heroes For A Righteous Game! I purchased the print version of this product from the Legendary Games site through Createspace. This was the first time I had invested in Legendary Games Heroes line of Pre-Generated Characters. When it arrived a few days ago I found myself thoroughly impressed. Additionally each character was beautifully illustrated with its own original art making them even more compelling and really bringing them to life in the minds-eye. Mechanically they were sound and absolutely playable. Not overly optimized, and definitely not pushovers, they appeared completely capable. They were also provided with both notes for scaling their build down to 15 point buy as well as notes for their suggested progression through 6th level to get the most out of them in this AP. In my mind the only optimized PC is one that is built to synergize with the campaign and in that respect these characters really deliver. Now, combine all that with the top-notch production quality that Legendary Games and their Design Team is famous for and you get a product and characters that synergize with the Righteous Crusade Adventure Path in a fashion far beyond my expectations. Once again they have really outdone themselves. This product caused me to reconsider purchasing the rest of the line for the other Adventure Paths. It is truly that good. Best of luck to the folks at Legendary Games and to all of you as well and Happy Gaming! Small correction: Illemandir Ziruul isn't exactly an arctic druid. He's just a half-elf with an arctic elf father. His domain is actually Earth as a druid with the menhir savant archetype...which is meant to better explain how he taps into the power of ley-lines, standing stones, and other sites of power. Oooooh ... I have Gothic Heroes and (Imperial) Heroes (for the Jade Regent AP)? Was that the name of that "set"? Anyway ... very curious/interested in Righteous Heroes. Also, Legendary Games just announced our new Kickstarter to get several of our products into print. We're starting small with the Gothic Grimoires line-up, but the stretch goals could bring some of the pregen products into the print compilation, as well, depending on how many stretch goals we hit. 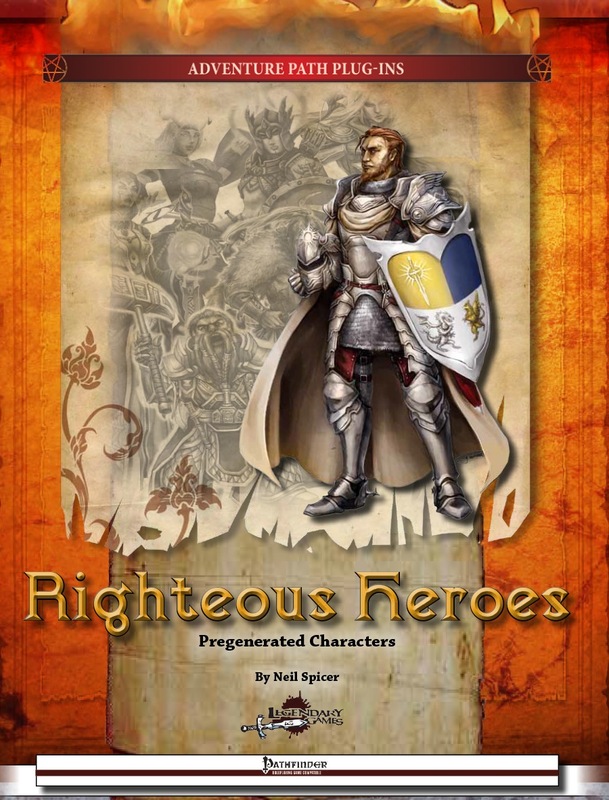 Unfortunately, Righteous Heroes isn't yet a part of that package, but you can still get them as a standalone print product at our website. I believe Jason is still using CreateSpace and Amazon for that. Print version now up for preorder. This product seems to be selling, but I haven't seen much in the way of commentary on it yet. I was hoping to get it into everyone's hands early enough so you'd be able to use it with the actual adventure path it's meant to enhance. Hopefully, folks get some timely mileage out of it. If so, let me know. I'm always interested in the feedback on this series so I can make adjustments for the next one. The print version looks great! I hope you do this with more of your titles. I liked all the characters and the art was great. The print copy looks even better than the pdf. I was happy that you decided to offer herolab files. The only complaint I have is that you didn't include the character portraits with the herolab files. That was the main reason I bought them. I hoped they were there. Overall a great product. Thanks for the feedback. I'm not a HeroLab afficionado, but maybe we can incorporate the character portraits into them as we go forward. Glad you liked the product, though. Consider offering up a review so others can glean the usefulness of it from your experience. If you save the file with a portrait selected it is saved with the file and can easily be distributed. Very easy to do. Looks like this product is picking up some steam (and sales). It climbed to #1 on the Legendary Games chart for the first time this week. That puts it in some pretty good company, considering how well the mythic plug-in's have been doing. Hopefully, folks get a lot of mileage out of this one. And I'd love to hear some more feedback. Does Legendary Games intend to create pregens for Mummy's Mask or Iron Gods AP? No plans for Mummy's Mask currently, but definitely for Iron Gods. One of the pledge levels for our last Kickstarter included an opportunity for a backer to work with me directly on defining one of the pregens for Iron Gods and I've already been in preliminary discussions with the guy who pledged for that. Currently, we don't have the timeline for when those pregens would become available. I'm halfway through pregens which would work well for Skull & Shackles. After that, I'll probably turn my attention to Iron Gods so I can honor that guy's pledge. The actual AP and Player's Guide should be out by that point, as well. Generally, though, we like to give a little bit of distance between the release of the AP and our AP plug-in products, though. Interesting. I presumed that plug-in products needed to be released at the same time as an AP. Not exactly. We try to time some releases with a new AP, but we also go back and pay homage to older APs by releasing support material for them, too. Iron Gods is going to be one we'll probably slow play a bit, but we'll see. I'm not suggesting it would be an entire year before we'd release something. But waiting a couple of months wouldn't be out of the question. It really depends primarily on what our schedule looks like as we approach August (which is when Chapter 1 of Iron Gods will hit the streets). Another 5-star review for Righteous Heroes, courtesy of Endzeitgeist. Thanks to everyone who takes the time to review our products! You're that guy who did that thing! And reviewed first on Endzeitgeist.com, then submitted to Nerdtrek and GMS magazine and posted here, on OBS and d20pfrd.com's shop. Also: Thank for the linkage! Happy to oblige. Thanks for the review!